Make fused glass puddles for use in a fusing glass pendant. "Puddles" is a term that originated in the Helios Glass Kiln Studio and is the subject of a great fusedglass.org tutorial at fusedglass.org puddles. This tutorial provides all the information needed to cut and fuse these origal glass shapes that can be used for a number of glass fusing projects. This is one of a number of tutorials to be found at the Fusedglass.org site. This fusing style has become very popular with many creations now seen on Pinterest and Facebook. Following this tutorial will allow you to make cabochons of different sizes and colors. This project is based around a "puddles" cabochon that was made by following the above fusedglass.org instructions. It has been contour fused to a base layer to form the pendant. It is not necessary to fuse the puddle to a base glass, a bail can easily be fitted. Size and color of the cabochon will help determine the overall design of the pendant. Firstly the glass has to be cut and stacked in the kiln , fused, cooled and cut into irregular shapes. The shapes are then placed back in the glass kiln and fired until they attain the required cabochon shape. System 96 has been used in this project. Follow puddle instructions to produce cabochons. Photo shows cut pieces ready for firing. Always ensure the kiln shelf is properly covered with kiln wash.
Do not over fire as the piece may stick to the shelf primer whilst it is still expanding and cause cracks to appear in the stack. Sometimes when firing the cut pieces a couple may fall over with a solid color uppermost. Clean off any kiln wash and flip the piece over and refire to produce a different result. 1. Cut two pieces of black base layer to suit the size of selected cabochon. 2. Stack layers together and sit cabochon on top, place on prepared shelf and insert in glass fusing kiln. 3. Bring temperature up steadily to around 1440° F (778° C) until the pieces are nicely rounded. Do not over heat or the item will fully fuse. Switch off, allow to cool to room temperature. 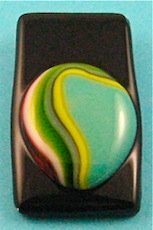 The cabochons can be used not only in jewelry but in a range of other glass fusing projects.